AMD Malibu Evaluation Board - Paragon Innovations, Inc.
Paragon Innovations designs the AMD Malibu Evaluation Board. Advanced Micro Devices Inc. (AMD), a global supplier of integrated circuits, required an evaluation board to enhance its AM186ED controller family and give users code-writing access. The company had only 10 weeks to develop a prototype to display at a national trade show. It needed a reliable, rapid-development source for firmware design. AMD tapped Paragon Innovations to design the Malibu evaluation board before the show. Results were successful; Paragon even created a sample board a month prior for product brochure photography. AMD developed 1,000 boards. Documentation and product were available at the show. Paragon produced over 1000 of these reference boards. 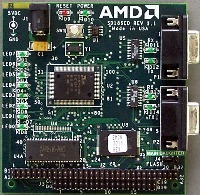 Complete hardware and software documentation – including IP rights – was provided to AMD as a value-add. Completed boards, user manuals, serial cables, power supplies, and packaging were delivered for a positive ‘out of the box’ experience. Brochures were made prior to the deadline. Production boards were available at the show. AMD benefited from Paragon Innovations’ integrated hardware and software engineering processes and teamwork philosophy. Both Paragon and AMD were able to work together to achieve not only a fully documented product by the show but also early articles for photography and marketing.